Unusually the Supreme Court in refusing permission to appeal of the above case has given reasons. I am assuming that is because the Latvian government supported the mother in the appeal and it is really high profile in Latvia (including being the subject of a debate today in the Latvian Parliament). There have been a number of public judgments and the refusal of permission by the Supreme Court is a public document. 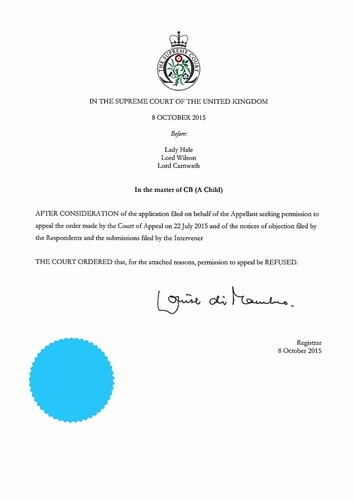 Here is the case when last in the Court of Appeal. This was an appeal from this High Court case. The case started off with two incidents. The first was when the mother was stopped by the police crossing the road whilst walking home in the early hours of the morning. She had taken her shoes off because they were causing her pain and placed them on the buggy in which she was pushing her younger daughter. She had been drinking with a friend that evening. Her younger daughter was returned home to be looked after by her elder daughter. 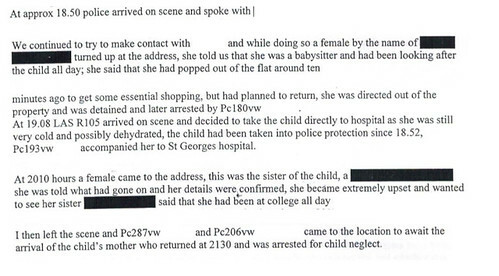 It should be noted from the police reports that they arrived at 18.50, then someone who said they were the babysitter arrived and then at 19.08 they took the child to hospital because she was cold. At that point they had not spoken to the mother. Hence it is quite clear that the mother had arranged prior to the police's arrival for a baby sitter to attend. This, of course, substantiates the mother's argument that she had arranged for a babysitter. She accepts and I agree that she should not have left home before the babysitter had arrived. It should also be noted from the police reports that the child's 18 year old sister arrived at 20.10. The High Court judgment makes no reference to anyone claiming to be a babysitter being involved in the matter. It remains an interesting question as to what would have happened had the babysitter turned up before the police. One would expect her to have changed the child's nappy and for nothing further to have happened. The case then moved on collecting opinion from the local authority. It is worth noting that the police decided not to prosecute the mother, but instead to caution her. It is also worth noting that the original view of the local authority (Merton) was to reunite mother and daughter (and sister). However, Merton then decided to increase their adoption target. They also decided not to reunite the family. Expert evidence was obtained from two experts one of whom proposed adoption and the other of whom suggested the family should be reunited. This is where the question about bias on the local authority becomes important. The Supreme Court argues that an independent judge automatically overcomes bias in evidence. That, however, is obviously not the case. From time to time a judge can decide to ignore biased evidence, but the judge is supposed to follow the evidence. Hence the fact that Merton is subject to a bias towards adoption is a key issue. There are lots of other technical legal issues about international adoption law and conventions. The local authority failed for years to contact Latvia about the case. The nub of the issue, however, is that because the mother left home before her babysitter arrived her daughter has been put up for adoption. Thank you for your hard work. Please check a very recent case in a family friends, family of four children, also from Latvia. https://www.facebook.com/pugacheviGB/?pnref=story It is in english and in russian languages.